Lent is a beautiful time to grow as a person. It’s a time to reset your attitude and to grow in your love for God and others. During Lent, we are advised to make a sacrifice, deepen our prayer life, and give alms to the poor and the church. 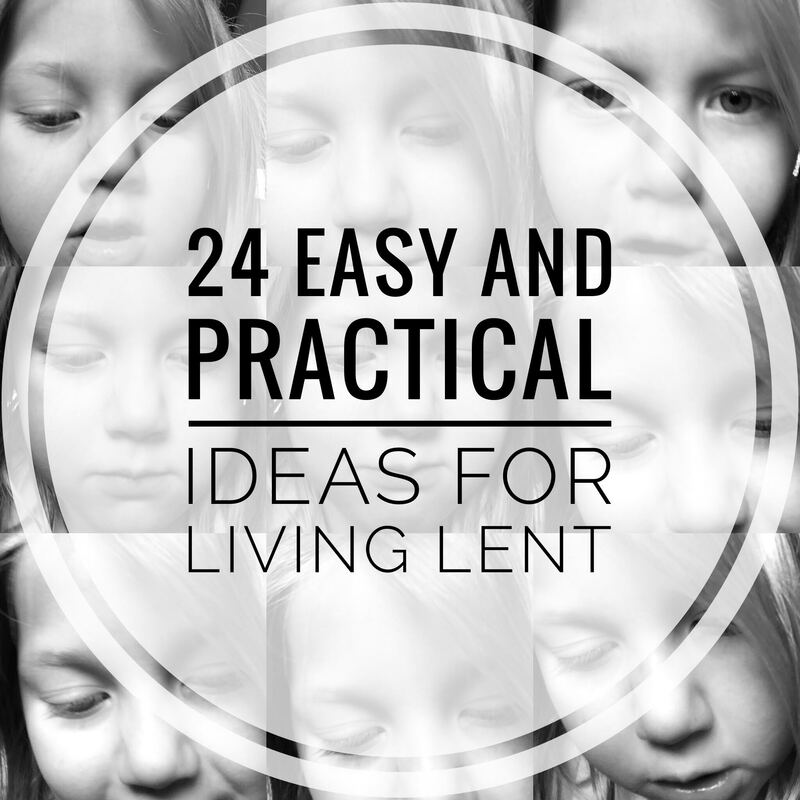 Here is a creative and practical list of ideas for moms of things we can offer up for Lent. They are “mommy friendly” and best of all, none of them involve giving up chocolate! Allow the Eucharist to be Your Strength. Consider going to Mass one more day a week (check out www.masstimes.org for suggested times near you). Maybe you can make the all school mass or a Saturday morning mass. After Lent, we hope this new habit will be one you keep. Go to Confession. Make an appointment on your calendar to receive God’s healing and forgiveness. You will gain new graces to help you in your vocation. Read the Morning Scripture. Start your day with the readings, unite yourself with Mother Church and the Readings of the Day. Make Your Calendar One of Prayer. List names of friends, family and acquaintances for whom you want to offer your special prayers and works on each day of your calendar. It is much easier to offer up your trials, tasks and prayers when you are thinking of others. Give Up Take Out. Give up drive-through coffee and other take out meals. Consider going out of your way to cook homemade meals for your family and do it with renewed love and dedication to having family meals together. Save the money you would spend on take out and donate it to your favorite charity. We love to save our “coffee money” every month and donate it to Mary’s Meals! Unplug. Work on screen free hours, days or weeks. Develop time where everyone in your family puts their phones down and interact in a renewed way with your children or spouse. Pray With Your Spouse Daily. Set just a few minutes aside each night to pray with your husband. It can be a simple decade of the Rosary, sharing your prayer intentions or spontaneous prayer. It can be a little uncomfortable at first, but take it slowly and allow this beautiful new habit to develop. Image 40 days of praying with your spouse and the changes it can make in your relationship. Keep it Clean. Make it your goal to keep a clean car and home all during lent. Take some time to work on keeping things neat and orderly. Have your children help and everyone should do it without complaining! When we are better stewards of our things we often appreciate more our many blessings. Declutter. Consider cleaning out unwanted clothing, shoes, toys, knickknacks and items from which others can benefit. Begin with asking other friends if they need these items, read the following post on Pass the Bag or find a thrift store that targets helping those most in need. Friendship Fridays. Reach out to your friends on Fridays – send words of encouragement, an old fashioned letter (check out pioprints.com for unique Catholic greeting cards), a text message or best yet, meet up and reconnect. Work Out with Jesus. Take some time this lent to focus on not only your spirit but your mind and your body as well. Walk, run, and lift weights with our Lord. We can use our physical acts as a way to strengthen your body, which is the temple of the Holy Spirit, and make also a time of prayer and contemplation. Lately, I’ve been watching www.formed.org videos when I am on the treadmill. Eat Potatoes, Rice orPasta. Work on reducing your food bill so you are able to reset your family’s finances and are able to tithe more to the poor. Each day, offer one of these three starches and challenge yourself to be creative, thankful and open to these staple foods that others around the world live on the entire year. Listen to Catholic Radio. Catholic Radio is a growing trend around the country and throughout the world. Consider tuning in and listening in on your drive to work, while you are in the kitchen or doing your laundry. This type of radio can not only be informative but you will find it entertaining! I did this as my lenten offering a few years ago and found it very fulfilling. If you don’t have this, stream it off your phone or computer on stgabrielradio.com. Read Spiritual Books. There are so many beautiful, inspiring Catholic books that can help us along the journey. Consider starting a book club or joining the St. Teresa’s Book Club on-line. Another great Lenten study is our book Divine Mercy for Moms. It makes for a great group study, with free videos, resources and a journal. Be a Better Friend and Stop Gossiping. Consider practicing this formula for speaking about others: Before you speak or post, take a minute and ask if what you have to say about your friend: Is it true? Is it necessary? Is it helpful? Allow this Lent to be a time of taming our tongues and redirecting our thoughts to be more charitable. Come Holy Spirit! Invoke the Holy Spirit throughout your day and watch this awesome series on the Holy Spirit at www.thewildgooseisloose.com. Your life will never be the same. Examine Your Conscience Daily. St. Ignatius gave the advice to always take a moment out to examen our conscience each night before bed. Check out this awesome app by Fr. Michael Denk, The Examen Prayer app to help you learn this meditative practice. Stop Yelling. Make a conscious effort not to yell at your children. This is the hardest thing I have ever done for Lent, however, one priest advised me, if you make it through Lent without failing at least once in your resolve, you chose something too easy! Examine Your Conscience On the Works of Mercy. Take time out to reflect deeper on these works of mercy and your overall attitudes. Use our The Corporal Works of Mercy Examination of Conscience and The Spiritual Works of Mercy Examination of Conscience. Do the Works of Mercy. Spend less time on facebook and social media and more time practicing the works of mercy! As a busy mom of 7, I can find myself wasting time trolling the internet and reading about my friends’ lives, but not always reaching out to others. Here is a simple mommy friendly list of ways to live out the Works of Mercy : Works of Mercy Checklist for Busy Moms. and the Spiritual Works of Mercy Checklist for Busy Moms. Managing Your Children’s Technology. Check out commonsensemedia.org and www.faithandsafety.org If you need an easy way to lock up devices for family meals, bedtime and regain control of devices check out Ourpack. Our family has benefited from these resources and I am sure yours will too! Work On Faith Formation With Your Children. Take time out to share your personal faith journey with your children. It is easy to tell them about the faith, it is just as important to share them how the faith has impacted your life.